He is all wrapped up and waiting for Santa Paws to arrive. Santa Paws? Who? Have I been good? Hey there, Lynnmarie. It is really good to hear from you all the way up in there in PA. Thanks so much for taking the time to come here and share your German Shepherd puppy story of your beautiful little Bocelli. And I absolutely love the picture you sent us of little Bocelli - he looks soooooo comfortable just hanging out waiting for Santa Paws to arrive! And as cute as he is, I imagine he got loads of great loot for Christmas. 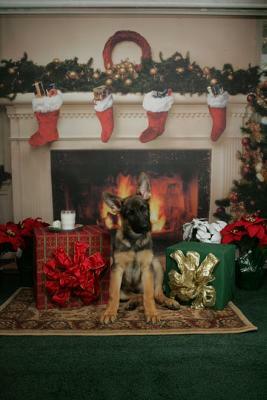 And the name Bocelli, what inspired you to name your German Shepherd puppy that? This is the first time I have ever heard of a German Shepherd puppy named Bocelli. But I really like it - it is different and not something that you hear every day.